I was worried that the voters of Maine might actually approve of gay marriage in Tuesday's referendum on the matter. Like New Hampshire, Maine has had to endure a leftward drift that is fed by Massachusetts natives moving over the border and bringing their liberal politics with them. There is a logic to protecting marriage and defining it as being between a man and a woman. The cornerstone of marriage is its purpose in solidifying a home in which children can be raised. Any alternative contrived by people to be a substitute for the family has proven to be cumbersome at best. Orphanages, group homes and foster homes have ten times the money and many more problems than do families, which generally educate, feed and clothe children at a fraction of the cost when the state takes over. Just a couple of thoughts about the movement for gay marriage. 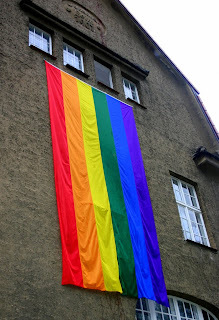 1) Why do gay activists so crave a societal stamp of approval? Why do they constantly demand affirmation that their way of life is as good as that of the straight majority. Then why the hell are you so sad "
3) Even homosexuals are dependent upon the straight majority. Why do you think that the term among gays for straight people is "breeders". Even though they have repudiated heterosexual unions, they are dependent upon them to replenish their ranks. 4) Overwhelming statistical evidence has discredited smoking as bad for one's health. There is evidence that is every bit as statistically compelling that homosexuality brings a laundry list of diseases. What are we to conclude? You may hate my politics and my religion. I may feel the same way about yours. You may make a disgusted face when I tell you who I voted for. I may reciprocate when I look at your latest bumper sticker. But what defines us as a nation is that we can live next door to each other, work together and ride the bus together without killing each other. If we can all sign off on that, then we are all good citizens. The same G-d who I learn in my scriptures prohibits homosexuality is also patient enough to let people make their own choices without immediately zapping them with a plague or a bolt of lightning. Let's all be honest. If you want to be out front about what you do, that is fine with me. But let me be out front as well and tell you what I believe. Better still, let's talk about the World Series , rock and roll or stamp collecting. Why do we have to rip the bedroom door off its hinges and invite ESPN in for live coverage? I don't know anything about what my close friends do behind closed doors. And I don't want to know. What makes you any different? No one wants to kick down your bedroom door and arrest you, or fire you from your job. If it comes down to that, you have plenty of defenders. But constantly seeking approval is intrusive and annoying. Enough already. No matter how"enlightened" people are on the street about homosexuality, it is a different story in the closet, or for that matter the voting booth. Start thinking about the rights of the majority to be left alone. The people have spoken. End of story.